On my way to meeting clients in York city centre, I decided to go earlier than usual to grab some breakfast. I usually have breakfast before I leave the house but on this particular day I wanted to treat myself and so I did. 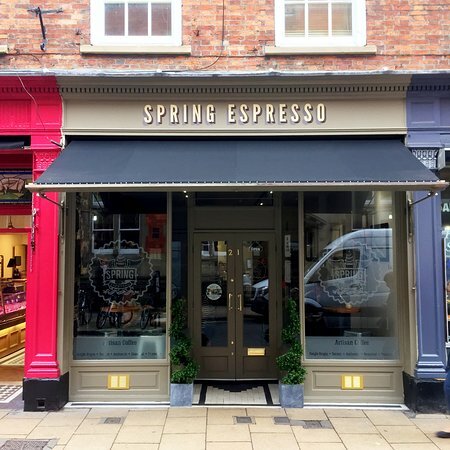 The walk from York Train Station took about five minutes before I reached Spring Espresso, where the friendly staff greeted me and uplifted my mood with a simple smile. As I walked up to order, the aroma of freshly ground coffee was to die for! I’m very fussy when it comes to coffee and tea. The only coffees I’ve ever truly enjoyed in the UK are Illy and Lavazza and I think that’s partly down to my heritage and partly down to baristas perhaps not being passionate about making a good cup of coffee. I’ve only been a coffee drinker for five years, so I still have plenty of tasting and educating to do! I simply had to order a coffee, a skinny latte. For breakfast, I opted for the smashed avocado, eggs and bacon on sourdough bread. As my coffee came out, it is beyond me how they walk so quickly and don’t spill a coffee that is so full! I used to own a café, being the clumsiest person in the world, waitressing wasn’t something I did, but more to the point, the coffee was delicious, strong and full of flavour. Let’s just say Square Mile Coffee is on my list of coffees to look out for! As for the barista, clearly passionate about making coffee, it was the perfect temperature and very well presented! The coffee was great, but my breakfast was even better! Perfectly presented. The first bite was mouth-watering. The sourdough bread was flavourful and I was pleasantly surprised by the amount of avocado I was served, usually, cafes tend to shy away from using more than what covers the bread, we all know avocado is quite costly, but this quite a generous, but correct serving. At first, I was disappointed by the lack of bacon, but once I finished my breakfast I was very satisfied. Had there been more food on my plate I would have been full, to the point of being bloated for the day, no one wants that! For a city centre café, the cost was very fair and worth every penny especially due to the excellent customer experience. A coffee costs between £2.30 and £2.60 and the crushed avocado, eggs and bacon on sourdough bread cost £7.70. No complaints from me! Spring Espresso offers a variety of options from posh bacon sandwiches, raisin toast, proper porridge, pancakes (someone was having these and they looked amazing!! ), all the way through freshly made salads, toasted paninis and fresh sandwiches made on artisan bread! I noticed that the staff were very attentive, making a point of welcoming everyone through the door, and saying thank you and goodbye to everyone that left no matter how busy they were. When it came to leaving, they did exactly the same with me. Needless to say, I was in a bright mood for the rest of the morning and left Spring Espresso with very positive feelings – I’ll be back soon!